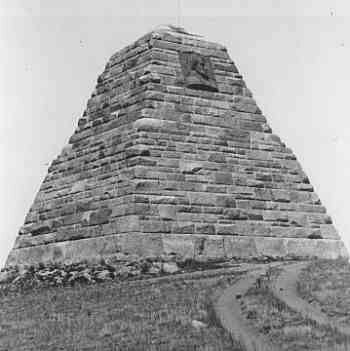 The Ames Monument is located about twenty miles east of Laramie at a place which was, prior to the relocation of the railroad about three miles south, the highest point (8,247 feet) on the route of the Union Pacific, the first transcontinental railroad to be built in America. When completed in 1882, the Ames Monument stood about three hundred feet south of the Union Pacific tracks and on a knoll which, being 32 feet higher than the tracks to begin with, caused the apex of the Monument to rise 92 feet higher than the railroad tracks. The monument, a memorial to the Ames Brothers of Massachusetts, was designed by the prominent American architect, H. H. Richardson, and built by Norcross Brothers of Worchester, Massachusetts. It was constructed of granite rock native to the area, the light-colored granite being quarried from a jutting pile of rocks one half mile to the west of the monument and skidded by horse and derrick to the construction site. The monument is geometrical, four-sided pyramid, sixty feet square at the base and sixty feet high. “Random ashlar” is the appropriate designation for the type of construction employed in the Ames Monument. “Ashlar” refers to the rough-hewn granite boulders by which the monument was constructed, while “random” refers to the coursing or jointing of the irregular-sized granite blocks in the process of construction. The Ames Monument was erected under the authority of a resolution adopted by the stockholders of the Union Pacific Railroad Company at a meeting held in Boston on March 10, 1875 in memory of Oakes Ames in recognition of his services in the construction of the Union Pacific Railroad.